It’s no secret; I’m a not-so-closet Disney fan. Remember, I’ve got self-diagnosed O.D.D. – Obsessive Disney Disorder. There is no 12 step program. The magic is real. The magic was real for my guy Walt Disney, too. 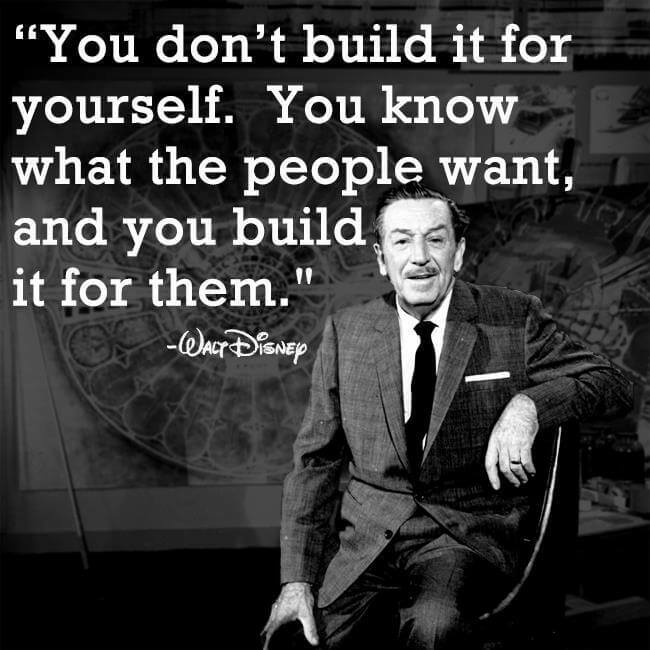 The average person doesn’t always jump to, “Walt Disney, businessman.” The guy was light years ahead of his time in many ways, but maybe no more so than with Guestology, understanding the customer experience. And Disney as a business has it down to a science. Walt had it right with this quote above. He figured out what people wanted and built it for them. And made more people than crazy ol’ me ridiculously happy. I’m not a customer; I’m a Guest. It elevates everything. It’s the gold standard for serving others. The idea of serving others isn’t words and platitudes. It’s culture. You aren’t an employee with the Disney Company; you are a Cast Member. You are on stage serving the Guests. I love Disney not just for the magic, but how Disney makes me feel. How I’m treated as a Guest. BANKCODE is playing in this sandbox. By using BANKPass, I can understand how my prospects and clients want to be served in 90 seconds or less. I can communicate information to them in the way they choose, not the way I choose because it’s easy for me. By using Buyology – asking my prospects and clients to tell me “Why They Buy” using BANK – I’m serving them better. BANKCODE is marching in the same steps that Walt Disney did; this system was designed to serve others and achieve success at the same time. Find out why so many companies are using BANKPass to serve their prospects and clients, and in doing so, supercharge their sales by 30%.